The 1960s saw the growth of the peace movement which was anti-war and about people getting along, very much a ‘You & Me‘ mentality. 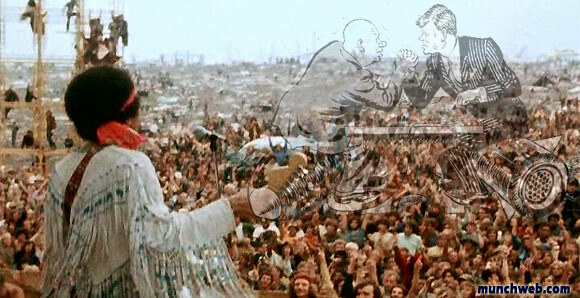 Woodstock is seen by many as the icon of the peace movement, is it a coincidence it took place in 1969 after an overall multi-decade up-trend in stocks which was topping? 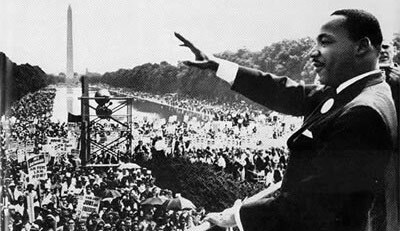 Similarly the African-American Civil Rights Movement took place during the boom which resulted in the Civil Rights Act of 1968, a culmination of progress for equality throughout the boom period. In the 1970s, a period of economic uncertainty, the peace movement faded away along with the African American Civil Rights Movement. During the 50s and 60s the overall trend was up for the U.S. stock market, but when dips in the stock market occurred it was a time when capitalist vs. communist tensions would increase. The most significant stock slump came in 1962 which was described as the worst crash since 1929. It would make sense that that Cuban Missile Crisis happened in 1962 just one month after the stock market bottom. Following on from this was Kennedy’s Assassination and the Gulf of Tonkin Incident. The latter of which resulted in President Johnson being given authority to send more troops, which reached 400,000 by 1967. By 1967 rising stocks and a growing peace movement saw the U.S. begin to reduce the number of troops in Vietnam. In December 1972 the Dow peaked above 1000 points for the first time ever, just one month after this top a peace agreement was reached. Hey, this is a cool correlation–stock trends and peace/war and social movements. I hadn’t realized some of these–the Cuban Crisis one is particularly hair-raising (but then, it was). Nice website, too–you doing social media now too? Next Next post: “You’re Either With Us or Against Us” | 9/11 or Stock Market Crash Responisble?